Sony KD-55XE9305 review | What Hi-Fi? Sony has kicked 2017 off with a stunning top-tier 4K HDR TV – and it’s not even the company’s long-awaited OLED screen. 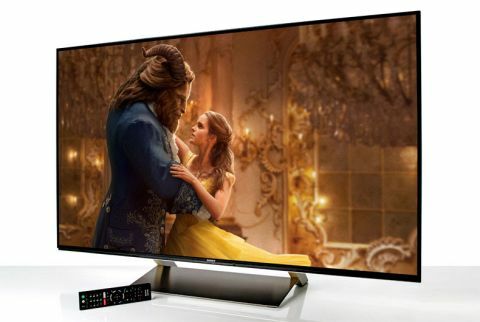 The 55XE9305 has all the basics: Ultra HD 4K resolution, with High Dynamic Range (HDR) support, and a list of features longer than this review. MORE: HDR TV: What is it? How can you get it? The top-tier XE93 series has the same image processor found in the flagship ZD9 and upcoming OLED A1 ranges: X1 Extreme, which promises to deliver more accurate detail, stronger contrast and smoother colour gradation when displaying 4K and HDR pictures. Not only does the X1 Extreme offer 40 per cent more processing power than the one in 2016’s XD93 range, its ‘object-based HDR remaster’ feature also claims to intelligently upscale standard content to 4K HDR based on how objects should really look, rather than just boosting the picture’s contrast and colour as a whole. More excitingly for this year, the X1 chip also gives the XE93 support for other HDR variants: Dolby Vision HDR (found on select Netflix shows like Marco Polo and some upcoming 4K discs), and the broadcast version Hybrid Log Gamma (HLG), used by the BBC for its Planet Earth II 4K trials. The latter two HDR versions will be available via software updates later this year, but the Sony 55in XE93 will come with the standard HDR10 straight out of the box. Sony has always had a knack for delivering a natural balance with its TVs, but the KD-55XE9305 raises that to a new level. We play our 4K HDR disc of Planet Earth II and are wowed by the detail and clarity on show. The colours are captivating, as the 55in Sony has a gorgeous way with rich colours and contrast. Vibrant greens, reds, purples and yellows on the hummingbirds’ feathers seem to leap from the screen. The tangle of green leaves and trees in the Jungles episode is handled with an impressive level of subtlety and depth. Motion is smooth, too, with little noticeable judder during slow panning scenes. Switch to standard Blu-rays and the Sony keeps this enticing, realistic balance in play. Skin tones are shaded with realism in The Imitation Game, and you can almost count the individual strands of the tiger’s fur in Life of Pi. Where we struggled to get the balance of bright whites and deep blacks right on the KD-65ZD9BU, we have no such trouble on the KD-55XE9305. Bright scenes gleam and glisten without ever straining your eyes. Sparks of fire and reflections of sunlight on water look stark, punchy and utterly enchanting. There’s a luminous quality to the picture that breathes new life into 4K HDR content we’ve seen before – from The Martian on disc to Jessica Jones via streaming – while never compromising black depth. Blacks are more convincing than we’ve seen on previous Sony LCD screens. And it’s not just evident in the way it displays the exciting space scenes in Star Trek Beyond, or the soft black feathers on penguins. The heart-stopping chase scene between the snakes and the iguanas takes place on a volcanic island that’s all greys and browns – a challenge for any 4K TV. That thrilling scene could easily have been a muddled mess on screen. But the Sony’s expert handling of crisp, nuanced detail combined with deep blacks and a vast variety of colour gradations means the rough, craggy texture of the hostile terrain comes to life. It’s an impressive picture. And Sony makes it look so easy. The set’s upscaling talents deserve high praise, too. Whether you’re watching old Blackadder episodes on DVD or standard definition daytime telly, you’ll still find fuzzy edges, noisy backgrounds and flatter colours. But it’s still watchable, and enjoyable, too. Singing the 55XE9305’s praises doesn’t mean it’s picture perfect. We’ve yet to receive 2017 TVs from rival manufacturers, but there’s an inkling that we could see more detail in dark scenes on the Sony. We’d like a touch more texture and subtlety in black areas and shadowy corners in Star Wars: The Force Awakens – it would give the picture that bit more depth and realism. There’s also a tiny hint of backlight bleeding in from the bottom left corner, but it’s not strong or intrusive enough to mar our enjoyment of the picture. The Sony’s edge-lit LED backlighting is otherwise even throughout the screen. In fact, this 55in Sony is such an innately confident and competent picture, we don’t feel the need to turn on any extra processing. There’s also an HDR mode that boosts the contrast of standard content, but we find it skews the colours and contrast balance too much. We’d turn down the brightness, contrast and clarity a notch to make the picture look more natural, but apart from that, it’s best to leave all additional processing on the 55in Sony off. We can add good sound quality to the 55in Sony’s list of accomplishments. This 55XE9305 sounds more robust than we’ve heard on past Sony flatscreens. It keeps that snappy rhythm and clarity we’re used to hearing on Sony TVs, but adds more body and solidity to the previously thin and treble-heavy sound. Unlike the usual down-firing speakers you get in most TVs, the KD-55XE9305 has front-facing three-way speakers with a total of 50W of power. It explains why the voices are more forward and direct. David Attenborough’s distinguished narration comes through clearly on Planet Earth II, while even the dramatic soundtrack is delivered with enough punch and exciting dynamics to keep us hooked on to every gripping scene in the nature series. That’s impressive for any TV. It’s no substitute for a dedicated soundbar or speaker package when it comes to film soundtracks or delivering the real grunt of explosions and action scenes, but we are perfectly happy watching The Man in the High Castle episodes with just the sound from the TV’s speakers. We’re now in an era where the latest smart and streaming features on a new 4K TV are almost as big a selling point as the picture quality. The Sony KD-55XE9305 is no exception, having just about every useful feature and app you can think of. Netflix, Amazon Prime Video and YouTube are your go-to services for original 4K and HDR content, as well as being a portal to more films, TV shows and funny cat videos than you could ever hope to see. Just make sure you have the appropriate broadband speed if you want to watch 4K HDR quality. Sony offers wi-fi and wired options; but as usual we’d recommend a wired connection for better stability. The KD-55XE9305 also comes with built-in YouView. That not only gives you a snazzy EPG that’s nice to use, but also access to all of UK’s catch-up TV services: BBC iPlayer, All 4, ITV Player and My5. All those apps (and lots more via the Google Play Store) can be selected from the Sony TV’s homepage, which is once again hosted by Android TV. The interface remains the same as last year: rows of apps, settings and recommendations all sorted in separate categories. It’s easy to get to grips with, although we wish bringing up the homepage didn’t take over the entire screen. You don’t get that with Samsung or LG TVs’ interfaces – their minimalist approach involves a single row of options that don’t obstruct the screen. We’d like something similar from the Android experience: a layout that doesn’t cut off what we’re watching when browsing apps or settings would be welcome. Sony has a halfway option in its Content Bar. Press the ‘Discover’ button on the remote, and a row of recommended shows from the channels and apps you’ve been watching will pop up. The more shows you watch on your TV, the more these selections will be fine tuned to your tastes. Other features include GoogleCast and DLNA, which let you stream or mirror content from your smart devices to the TV’s screen over wi-fi. The Sony KD-55XE9305 is a wonderfully minimalist design. The 55in LCD screen is left exposed with only a slim black bezel surrounding the frame. It looks sleek and smart. The rectangular pedestal stand is a welcome sight, too. Unlike the fancy, length-spanning designs, this understated aluminium stand is far more practical. The Sony 55in screen’s small footprint means the TV will easily fit on most TV racks. It may be understated, but everything about the Sony XE93 is designed to be practical and work seamlessly. Sony’s remote control follows this ethos: it’s a simple, logical layout with a matte rubber finish that feels nice without being flashy. There’s a slight delay between pressing a button and the command happening on screen – but it’s something we could imagine getting used to with daily use. The back of the TV deserves a mention, too. The XE93 borrows the grid-like pattern from the flagship ZD9 series to give you the illusion of a seamless one-piece panel. But it’s actually cleverly hiding all of the TV’s connections under multiple panels. Pop the panels off, and you’ll find a generous helping of connections. There are four HDMI inputs – all functioning to the latest HDCP 2.2 standard, which means they are fully capable of playing 4K and HDR content. Three USB ports are available for playing stored media files, while one can also handle HD recordings. Along with legacy composite and component inputs, there’s an optical digital output, and Freeview HD and twin satellite tuners. Sony has also designed some clever cable management that loops through the panels and down through the stand’s hollow feet, so you never have to see unsightly wires hanging down when you’re watching TV. Sony has set the bar for all 2017 4K HDR TVs to come. This 55in TV isn’t just a tour de force of the latest TV tech and features; it’s simply a wonderful set to watch. At £2400, the price is higher than we’d usually see for a 55in LCD TV. Last year’s model, the KD-55XD9305, was £2000 when we first tested it, but the current political climate means we’ll be seeing a lot more increases in prices throughout the tech world. But this Sony TV is unquestionably worth the premium pricing. If this is the level of performance we can expect from 4K HDR TVs this year, we’re very excited.